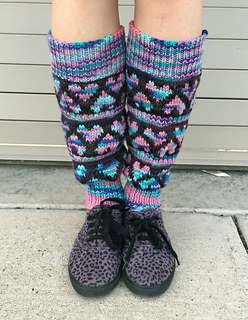 The Scrunchy Heart Legwarmers are worked from the top down and are tapered towards the bottom to follow the shape of your leg. They are meant to hug your calves, but be a little less form fitting around the ankles for plenty of scrunch. The Fair Isle heart pattern is notated in an easy to read chart. If you haven’t done a lot of colorwork, this is a great beginner project to build your skills! 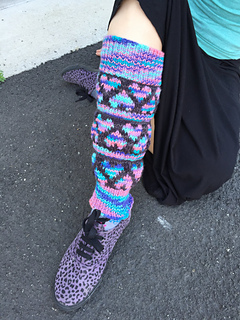 The pattern is written for one size, but there are instructions on how to easily modify the pattern to get just the right circumference and length to ensure your legwarmers fit like a glove.